The Biophysical Impact Assessment contained in the sections A, B, C, D & E tabbed in this section document the existing wildlife, details their habitat and makes recommendations for improvements to wildlife corridors and habitat. It also documents existing trees and plants found native to this area. For many of our neighbours this will be an interesting read and the historical photos will provide some insight into what the land was like only a few decades ago. The course design calls for significant re-forestation of the land. By planting a large variety of conifer and deciduous trees, native to the area and of various sizes, in clusters between the fairways we will be improving air quality and wild life habitat and migration. We will incorporate a number of water features which will attract more wild life and birds; and be attractive features while the water’s continual movement will keep mosquitoes at bay. We are aware we may have a species of the endangered wild flowers called Shooting Stars that need protecting and we have every intention of doing so. We want to enhance this environment to the benefit of all living organisms found on site, perhaps attracting others. Good design principals will enhance wild-life habitat and one of our most important goals is to become an Audubon Certified Golf Course http://acspgolf.auduboninternational.org from opening day onward. New technologies in water conservation, water treatment and irrigation will work in a complimentary fashion reducing water usage and provide opportunities for the re-use of waste water in a way that further enhances the environment. It is a common and necessary practice to remove and clear trees on farm land to facilitate long wide fields so that large farm equipment can easily manoeuvre. This by its very nature is contrary to good land stewardship and we have long chosen to plant more trees and bushes to encourage and protect wild life and the environment rather than tear trees down. We have planted well over 20,000 trees in the past 21 years. Most of these were planted in areas around the perimeter of our fields and within tree groves. Many more trees will need to be planted and moved into groves and clusters between the fairways and around the perimeter after rough-grading has been completed. Chinook Ridge Lodge will utilize wind and solar power for much of its’ electrical needs; we hope to tap into the endless supply of geothermal technology and use it to moderate indoor temperatures. The use of these passive energy and heat sources is much more environmentally friendly than conventional sources. Outdoors we intend to use either electric or solar powered golf carts which are more environmentally friendly and we are exploring a custom designed balloon tired bicycle which can use human leg power/small electric engine. Other pollution from fertilizer/herbicide is discussed under the Water section, but keep in mind that unlike farmers, who do not need pesticide certification, Chinook Ridge will be strictly regulated through the Alberta Environment’s Pest Management Regulation Act (PMRA) and by Audubon Certification. Because of this, we will use less pesticides and fertilizers than area farms. Although the mowed areas will require upkeep, the act of mowing will be much less detrimental to the soil and the environment than typical farming which kicks dust and other pollutants into the air. 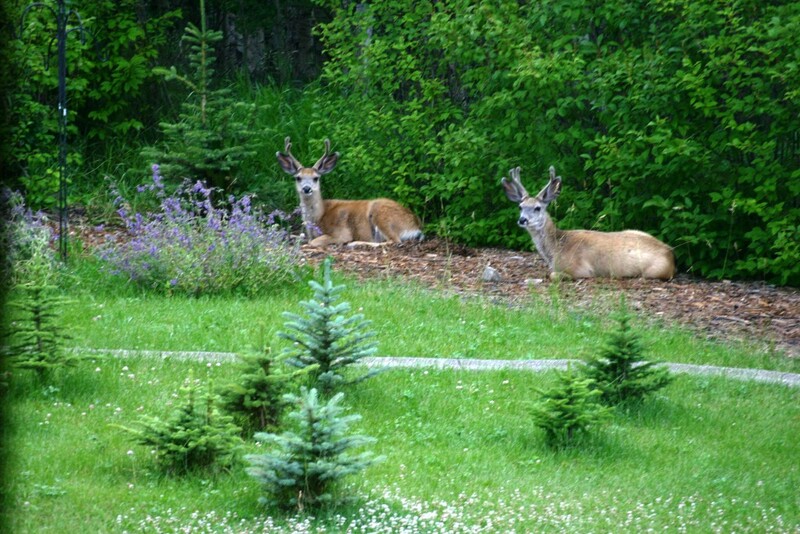 The photo below is of twin bucks who played in our back yard this summer.